When you see it on the menu, you may think that the Lychee Fried Rice would be something out of the ordinary. It doesn’t seem so after all. …which was placed beside the scoop of fried rice. 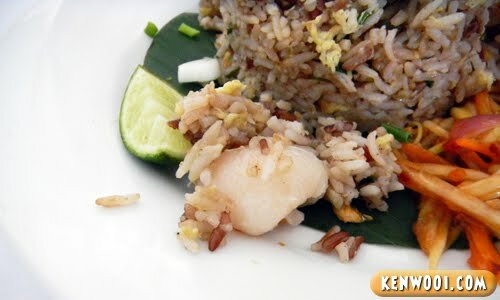 There you go Sir, your Lychee Fried Rice! Huh? Like this also can?! Now I can start selling Apple Fried Rice or Guava Fried Rice! YES!!! Gimmick! To hoodwink unsuspecting customers! How much did you pay for that? Must be more expensive than usual. Should tell people the name, take a photograph of the place and share… This kind of people must be taught a lesson – let them go bankrupt! 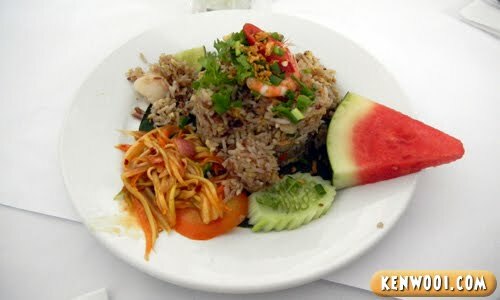 nasi goreng laici? First time dengar nih. Huh! Lychee fried rice? Think *Leceh Flied Lice* sounds better. Once I blogged about making Japanese Curry Rice with Lychee and fed beggars! It was damn yummy and didn’t waste all the so many cans collect during CNY. ken, buah tetap buah even buatlah mix dgn apepun ttp rase buah, so kena mkn buah dulu sblm mkn nasi ok! This 1 should be called . . . Single Lychee Fried Rice LOL! it only attract the curiosity for first time. only a piece of lychee?? sorry mate, that looks kind of failed :P try again next time!! harr?! if like this only, i wont bother to order it!